La Liga’s title race is going to the wire, as all three contenders claimed important victories yesterday. In recent weeks they seemed to have been taking it in turns to drop points, but it’s becoming increasingly difficult to predict who will claim the crown. The Barcelona derby opened proceedings. Espanyol kept the match tight against their local rivals despite tipping site Gamblingsites.net who write about the importance of gambling safely, predicting a Barca rout. It looked as if Tata Martino’s points were in danger of dropping more points, until the wizard came to their rescue again. Espanyol’s Javi Lopez handled the ball inside the area, and Lionel Messi made no mistake from the spot. Ironically, Lopez could handle the ball legally 15 minutes later as he had to don the gloves when Kiko Casillo saw red. It was a hard fought win for Barca, and a vital three points. Next came Atletico Madrid away at Athletic Bilbao. Both sides are in great form, and it was Athletic who took the lead at home after just 6 minutes through Muniain. Diego Simeone’s men have rediscovered their metal. The outstanding Diego Costa equalised after 22 minutes. It’s not hard to see why he is in demand from both Chelsea and Liverpool. A draw wasn’t enough for Atletico, and they laid siege to Iraizoz’s goal in the second half. The winning goal came on 55 minutes, a superb solo goal from Koke. A fifth La Liga win in succession keeps Atletico on top of the table by a point. The gauntlet had been thrown down and Real Madrid picked it up with ease. They sauntered to a 5-0 win at home to Rayo Vallecano. Madrid have looked surprisingly fragile in recent matches, having lost two in a row. 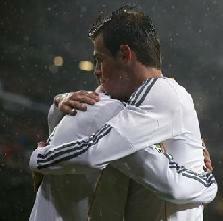 The star man was Gareth Bale. The Welsh wonder is really hitting his stride now. He scored two goals and ran Vallecano ragged. Ronaldo, who else, scored the opener after 15 minutes, and other goals were contributed by Carvajal and Arsenal target Morata. The win was much needed, and although Real Madrid are now in third, three points behind their city rivals Atletico, they’re impossible to rule out. At La Liga blog, we’re incredibly excited about the run in. We’ll keep you informed of the action, the twists and turns, every step of the way. We’ll also bring you the latest transfer gossip and breaking news. Be sure to follow us every day, for the very best of Spanish football action.